The government dreads the students combining with the working class. Last Monday it savagely beat the students, BUT THEY FOUGHT BACK. On Tuesday it couldn’t prevent 50,000 workers and students from holding the street for 6 hours, until the government made the Latin Quarter prohibited. The fight is paying off, but nothing has been won. THE U.N.E.F. HAS ASKED THE CONFEDERATIONS TO ORGANISE A GENERAL PROTEST. To triumph, it’s necessary to set up a way to organise democratic decisions on action against the machinery of the centralised state. The workers and students must hold assemblies and form their strike committees in every faculty and enterprise, with representatives that are elected and subject to recall at any time, forming a NATIONAL STRIKE COMMITTEE AND PREPARING PROTESTS TOGETHER WITH THE WORKERS. For the first time since 1940 a vice-chancellor has dared to call the police into the university! Only the Gestapo and Pétain, in their time, closed down the Sorbonne. the freedom of the university is an integral part of democratic freedom and workers’ freedom. THEY ARE LYING TO YOU , when they tell you students want to defend their privileges. If the bourgeoisie wipe out our freedoms, they are also wiping out yours. The Ministry and the Government want to expel from the university 2/3 of the students whom the Gaullist vice-chancellor has described as “scum”. In order to ensure the survival of the profit régime, the bourgeoisie and the state have established a whoIe series of structures aiming to impose unemployment and dismissals, the end of Social Security and pension schemes, to destroy workers’ organisations and freedoms. – There are too many schoolchildren in the schools, too many apprentices in the technical colleges, too many students in the universities! 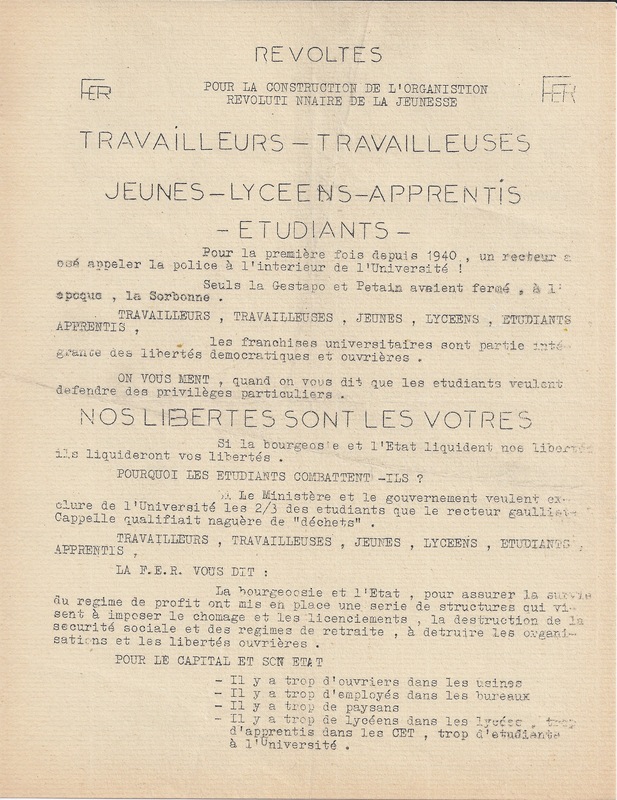 to selection, to repression, as the CAEN workers said no on 26 January, whilst fighting against unemployment and sackings. 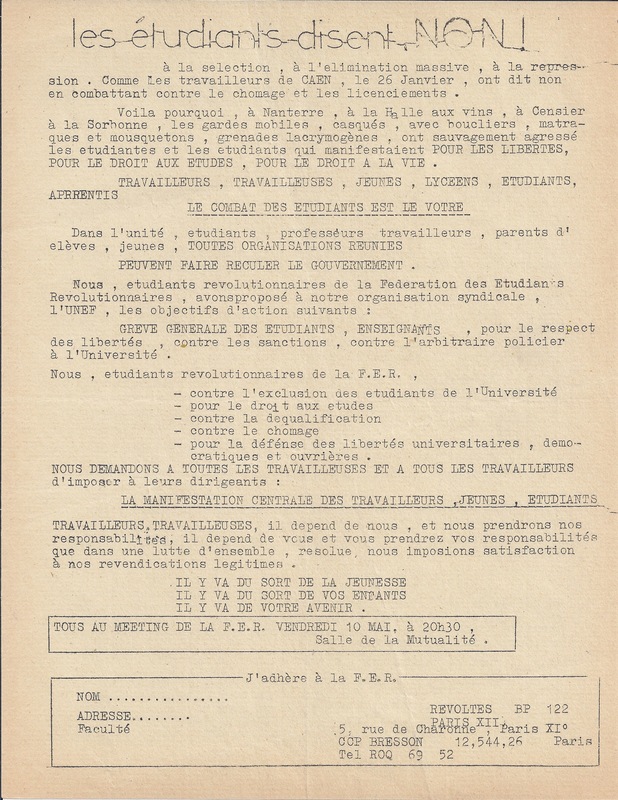 This is why at Nanterre, at Halle-aux-Vins, at Censier and at the Sorbonne, gardes mobiles, guards helmeted, with shields, clubs, rifles, and tear-gas grenades, savagely attacked male and female workers who were demonstrating FOR FREEDOM, FOR THE RIGHT TO STUDY, FOR THE RIGHT TO LIVE. A GENERAL STRIKE OF STUDENTS AND TEACHERS, for the respect of freedoms, against sanctions, against police despotism in the university. – for the defence of university, democratic and workers’ freedoms. MEN AND WOMEN WORKERS, it depends on us, and we shall accept our responsibilities, it depends on you, and you will accept your responsibilities so that resolutely, in a united battle, our legitimate demands will be satisfied. THE DESTINY OF YOUNG PEOPLE IS TO BE DECIDED. THE DESTINY OF YOUR CHILDREN IS TO BE DECIDED. YOUR FUTURE IS TO BE DECIDED. This tract was distributed on or around May 5. Given that it was offset printed, rather than mimeographed like most of the early student pamphlets, it is almost certain that it was printed before the events of May 3 took place. It therefore gives a good indication of the state of radical student politics on the very eve of May 1968. 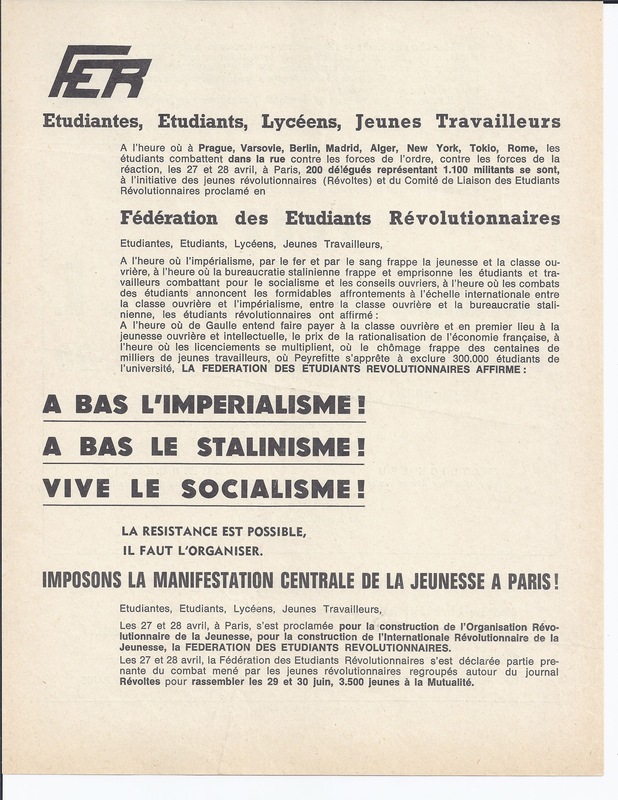 WE INSIST ON A JOINT DEMONSTRATION OF THE YOUTH OF PARIS! On April 27 and 28 the FEDERATION OF REVOLUTIONARY STUDENTS came out in favor of formation of the Revolutionary Organisation of Youth and of the Revolutionary International of Youth. 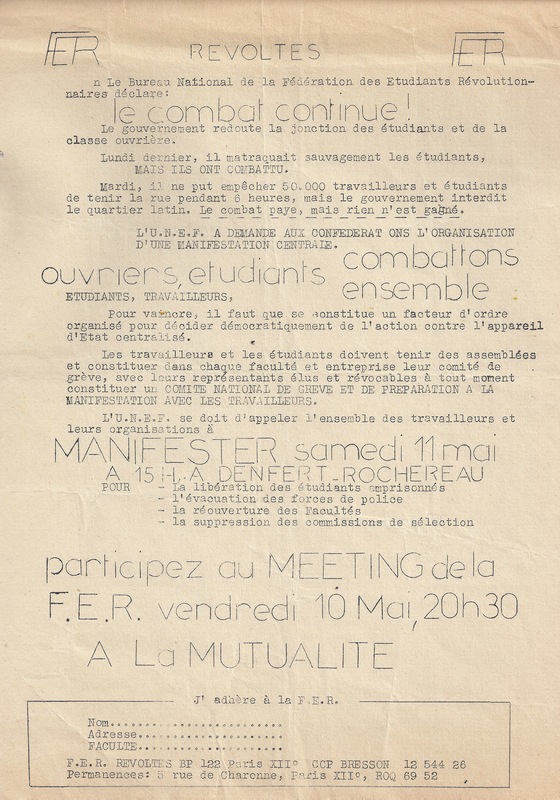 On April 27 and 28 the Federation of Revolutionary Students declared that it casts its lot with the fight led by young revolutionaries grouped around the periodical “Revoltés” in order to assemble 3,500 young people at the Mutualité on June 29 and 30. The Federation of Revolutionary Students calls on hundreds of thousands of students to fight for socialism, against capitalism, against reformist and Stalinist bureaucracies, BY JOINING ITS RANKS. The Federation of Revolutionary Students calls on students to fight by the thousands under the flag of socialism! The F.E.R. calls on students by the thousands to help build the revolutionary youth organization. 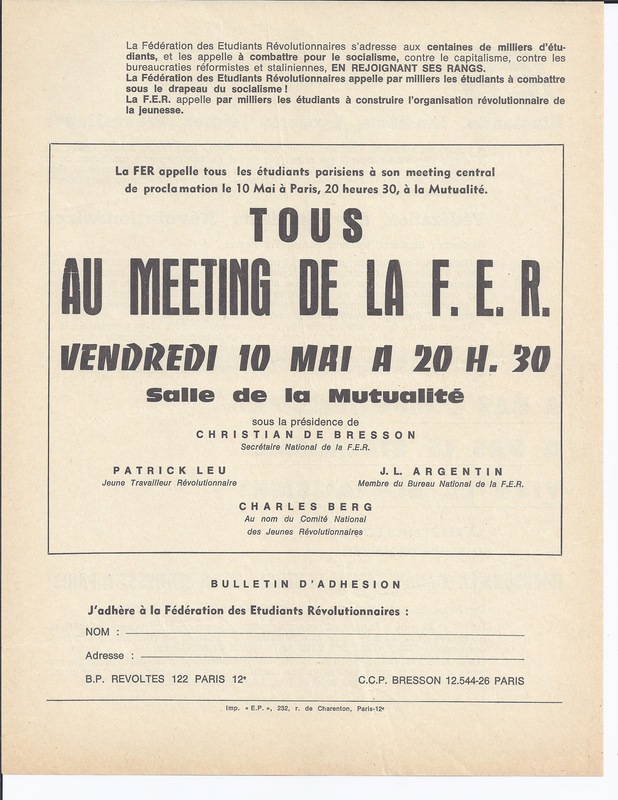 The FER calls all Paris students to its joint proclamation rally on May 10 in Paris at 8:30 p.m., at the Mutualité.